Last year I started a New Year’s Eve tradition of picking the “Top Space Story” for the year. In 2013 it was “The Chelyabinsk Airburst Event”. Hillary Howard, Dimitri Sotis and I discussed on air some of the triumphs and tragedies of space in 2014 which hinted at what I consider to be tops in space this year. I gave great consideration to naming NASA’s successful launch and recovery of the Orion spacecraft earlier this month as the winner but it lacked one thing that the winner had - empathy. 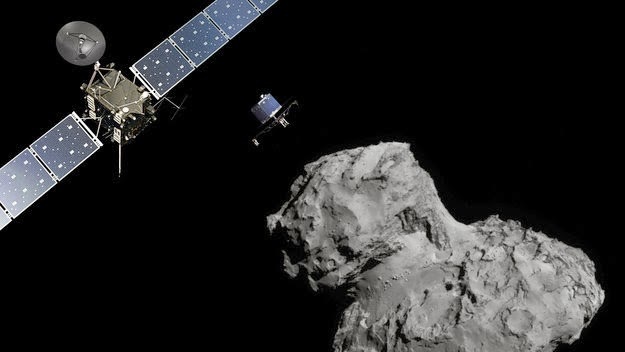 Sky Guy Greg Redfern’s Top Space Story for 2014 is: The European Space Agency (ESA) Rosetta Mission. Rosetta was a bold mission to a distant comet that took 10 years and billions of miles of precise solar system travel to rendezvous with Comet 67P/Churyumov-Gerasimenko (Comet 67/P) in August 2014. One of the mission objectives was to attempt humanity’s first ever landing on a comet via a dishwasher size probe named Philae. It took several months of reconnaissance of the comet to identify and finally select a suitable landing site for Philae. In the meantime Rosetta returned stunning photographs of Comet 67/P. The Twitterverse, mainstream media and the ‘net in general were absolutely spellbound (myself included) for a few hours on November 12th as Philae detached from the comet orbitng mother ship and began the drop to the surface. This was a completely autonomous landing with no intervention from Earth or Rosetta and it was do or die, literally, for Philae. A million things could go wrong and some did, but Philae made it. Tweets, news stories and live feeds about Philae’s fate captivated many and the lander took on a human like persona that endeared it to all. Tweets stating “I did it!”, “I’m feeling a bit tired” created a folowing for @Philae2014 that numbers 386,000 followers and will surely grow. The little lander that could sent a last Tweet dated November 14th telling all that it was going “zzzzz” - which meant that the onboard batteries were exhausted and hibernation was starting. The Tweets from Philae really struck a chord with all who read them, I know they did with me. It is hoped that Philae will awake later in 2015 as Comet 67P/Churyumov-Gerasimenko gets closer to the Sun and sunlight hits the craft’s solar panels. This will possibly recharge Philae’s batteries and the data from the surface of a comet can flow once again. Philae’s parent spacecraft, Rosetta is in good health and will orbit Comet 67/P in the upcoming year. The spacecraft has returned one of the most stunning solar system pictures I have ever seen and beats ANYTHING I saw in the comet disaster movies Armageddon and Deep Impact. We will learn much about comets with the Rosetta mission in 2015. I will be sending a “Happy New Year” Tweet to Philae tonight. Why don’t you do the same? I wanted to share this astropic I took last night as it shows the first confirmed gravitational lens - a consequence predicted by Einstein's theory of relativity in which a foreground massive object bends spacetime so that objects in the distance can become multiple images in space from our point of view. The light from this double image of a quasar (the center of a galaxy that has an active supermassive black hole and is incredibly bright as a result) traveled 8.7 billion light years to be collected by a 20-inch telescope and fall upon the CCD detector. This is the most distant object I have ever photographed and it has me in awe of our Universe AND our ability to comprehend it. Happy New Year to you all…….tomorrow I will post my "Top SPace Story of 2014". Here is the latest info and sky chart for finding Comet Lovejoy which has continued to brighten and is reported to be at naked eye visibility from dark sky sites. Tonight, 1/4/15. 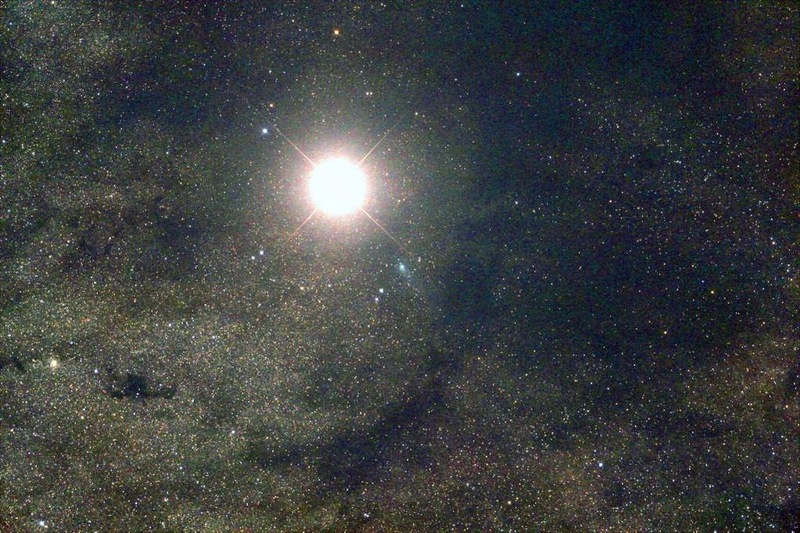 the comet is near Rigel in Orion. Here is what it looks like in the sky - it is the bright green object near the center of the camera. This was taken in strong moonlight which interferes with seeing the comet until 1/7/15. Using binoculars will really help with the view, even in moonlight and urban settings. 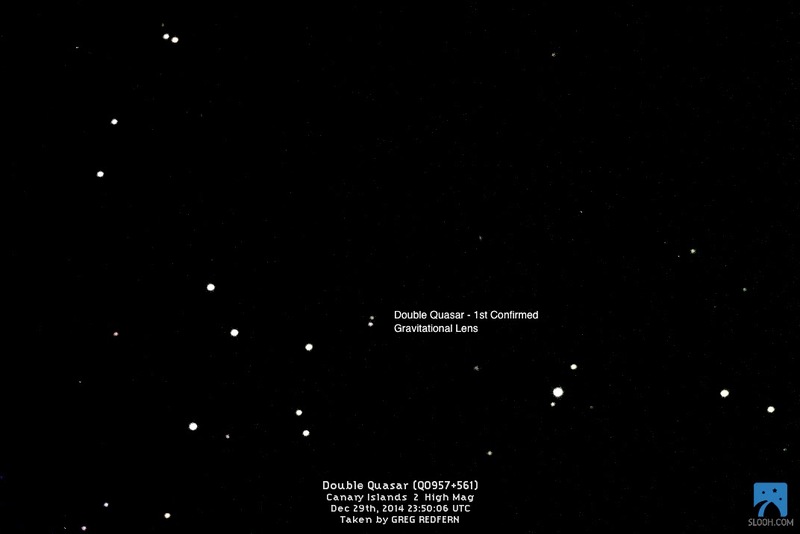 Read this article and use the finder chart to try and see this beautiful visitor from the beginning of our solar system; Try and find a site that is free of lights and has a good view of the SE and S horizons. 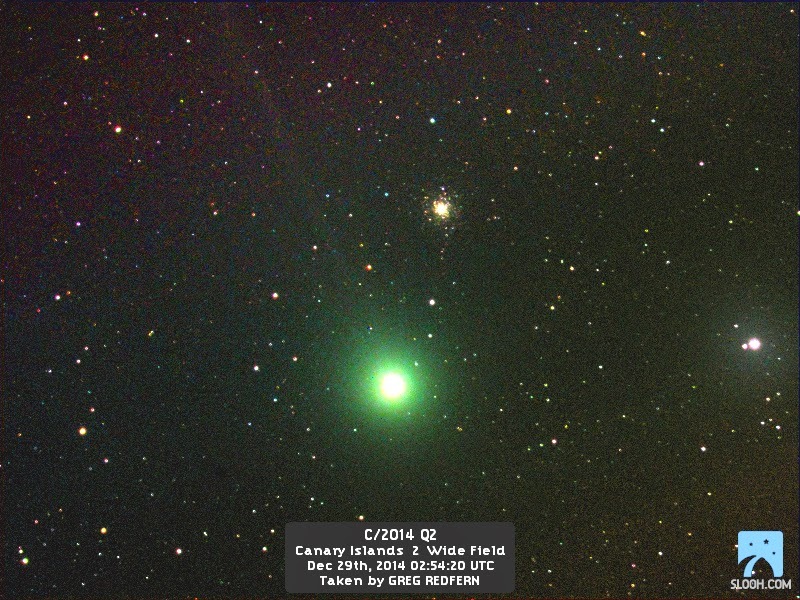 Binoculars will be a BIG help and once you zero in on Comet Lovejoy try and see if you can see it with just your eyes. I'll post more pics and info as we continue to monitor the comet. Been busy spending time with my family and taking pictures with the Slooh telescopes (more about that later. Astronomers are zeroing in on trying to actually capture images of a black hole. I hope they are successful in zeroing in on the 4 million solar mass black hole that resides at the center of our Milky Way Galaxy. This indeed would be the image of the century and FINALLY prove the existence of black holes beyond a doubt. If Santa brought you a new telescope for Christmas - lucky you - here's a good article on what you can do with it. By New Year's you will be able to add the planets Venus and Mercury to your observing list as well as a new comet. 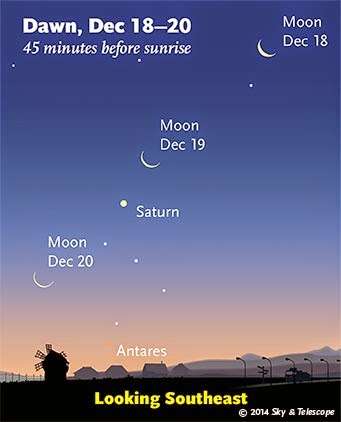 Saturn will be nicely placed in the early morning sky by mid January. Make sure you follow all of my "Sky Guy Viewing Alerts" here and on Twitter @SkyGuyInVA. 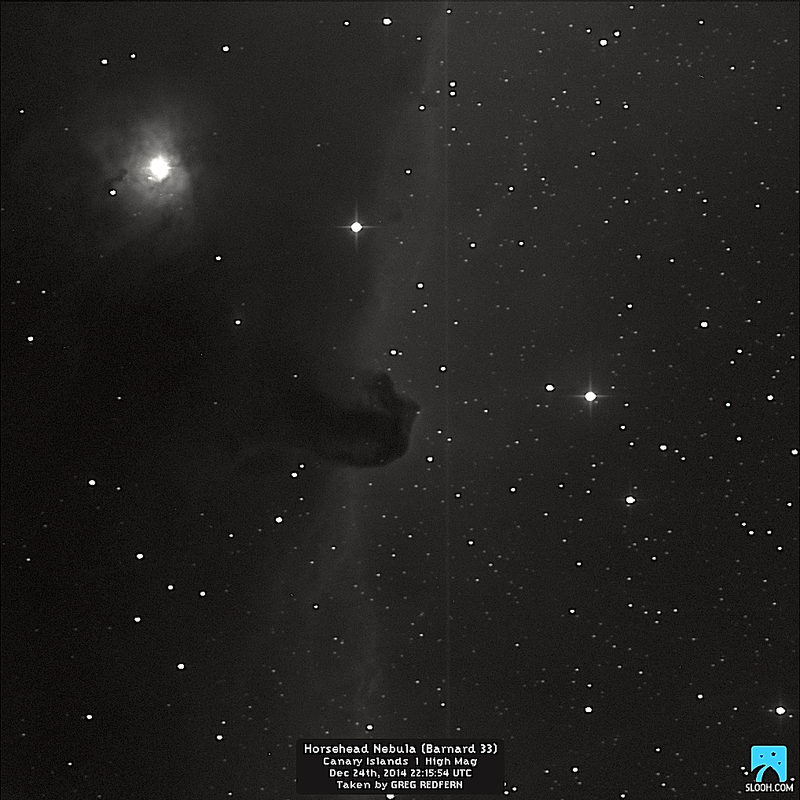 Enjoy this picture I took of the Horsehead Nebula with a 20-inch Slooh telescope. May this holiday season be safe, joyous and merry for you and yours. Our Milky Way Galaxy (MWG) and the Local Group - the 50+ galaxies that form our galactic cluster of which the MWG is part of - got a new neighbor. Just discovered, the small, isolated dwarf galaxy Kks3 lies 7 million light years away. Discovery of dwarf galaxies like these help us to understand galaxies overall and how they begin and evolve. Happy Holidays to all of you around the world and thanks for dropping in. You owe it to yourself to see this picture. Stunning is not even close to describe what we are seeing. These cliffs are a kilometer tall and are located on a COMET! The detail in this picture is amazing as we can see texture in the cliffs, boulders on the surface, smooth areas……I could go on and on. I am so looking forward to seeing how this comet will change as it gets closer to the Sun and begins to sublimate its material out into space. The Rosetta spacecraft will swoop down to within just 4 miles (!) of the comet in February. If this is done successfully the pictures we see will be capable of showing detail that is INCHES across - wow. I'm hoping the weather clears so I can get some pics of Comet Lovejoy which continues to brighten and may grace our skies in early January. Check out this view of our Sun in high energy X-rays. A NASA spacecraft used to study energetic objects in the Universe turned its instruments towards andy Sun and showed our star to be quite the show. Bundle up and get out to enjoy the skies of winter. Check out this incredible video of NASA's Orion spacecraft re-entering the Earth's atmosphere. The view is what an astronaut aboard the spacecraft would see so you get a perspective that is rare. Also check out the picture of the spacecraft - make sure you click on the image to get the enlarged view. Ho, Ho, Ho! Happy Holidays! Welcome to the “What’s Up? The Space Place” holiday edition to get some great gift ideas for that stargazer of yours. OK, you have 6 shopping days left but don’t panic. Internet shopping and quick shipping will get that star minded someone, including possibly yourself, their gift in plenty of time. As a first step for someone new to astronomy I recommend getting them a magazine subscription to either (or both) Astronomy or Sky and Telescope. An added bonus is that when the magazine arrives each month it will be a reminder of you to that special stargazer. 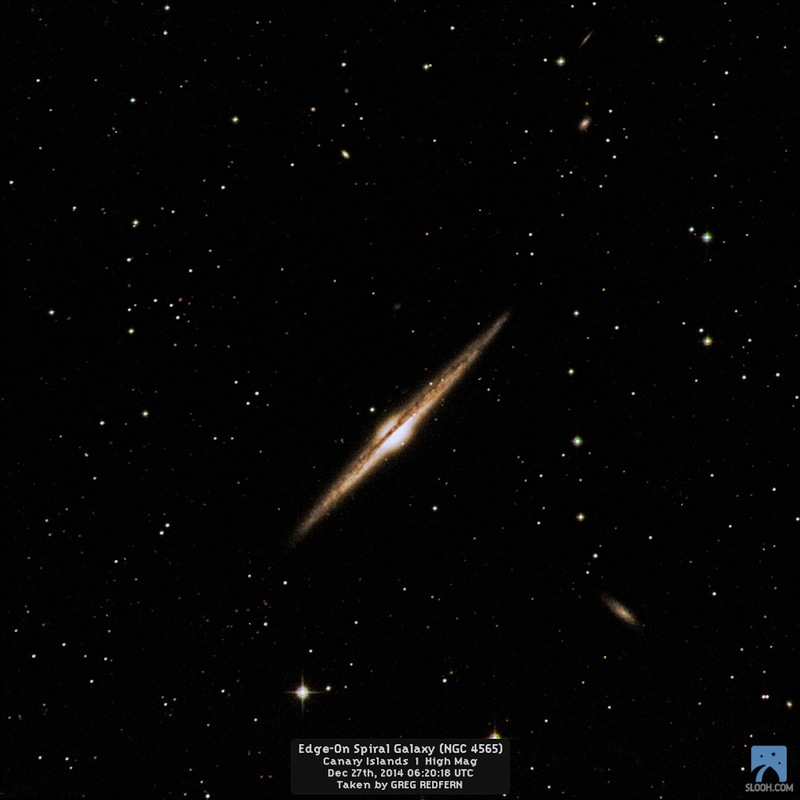 Astronomy and S&T also provides a digital version as part of the magazine subscription which comes in handy. These monthly magazines and their respective excellent websites are chock full of observing advice, astronomical equipment, pictures, book reviews, astronomy related ads, news AND monthly observing guides/star charts. I will admit I am an S&T subscriber and have been my whole life; I have also done major feature articles for them and been a total solar eclipse cruise staff member. There is a literary universe of astronomy and space related books out there. 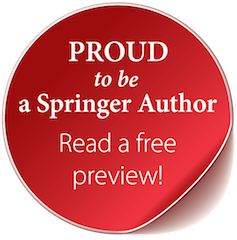 You can browse Amazon and Barnes and Noble to find a title that fits your buying fancy. If you know what tweeks your stargazer’s interest you can try and buy a book. But I recommend giving them a gift card that they can use to buy a book of their choice. You may want to browse these websites in advance to make sure the gift card has a sufficient value to cover these usually expensive books. This has been a tried and true present to me from family for decades. For a truly out of this world gift you can buy an actual space rock or more realistically, a piece of one, from the asteroid belt, Moon and even Mars. I have been a meteorite (space rock) collector for many years and have 208 in my collection. Truth be told your avid stargazer is probably frustrated at times with our cloudy weather. Nothing cures this frustration better than holding a piece of the solar system and contemplating where it came from and how it got to Earth. You need to know your dealer in buying these amazing rocks that are 4.5 billion years old. New England Meteoritical Services has what I consider to be the best and most reasonably priced presentation sets for purchase which you can see when you scroll down their webpage. I have personally dealt with them and I highly recommend them. A great sock stuffer is a space themed movie. The Star Trek movies (new and old), ’‘Gravity’, ‘Europa Report’, ‘Cosmos the Series’ (original and new versions), any of the National Geographic, Science Channel, Discovery Channel, History Channel space themed segments are excellent. If you have a budding stargazer that wants to see more of the sky than what their eyes alone can provide, quality binoculars are the ticket. A whole new view of the sky becomes possible and as an added bonus they can be used in daytime for bird watching and sporting events. A good pair of binoculars will show impressive detail on the Moon, a few galaxies, star clusters and nebulae (you need to know where to look) and if you hold them steady enough, the four main moons of Jupiter. Star colors are richer in binoculars and very pretty to look at. I recommend “7x50” binoculars - the 7 is the magnification while the 50 is the size of each objective lens in millimeters. This is a good compromise between magnification, light gathering ability and field of view. Less magnification means less detail but a wider field of view while more magnification reduces field of view while giving more detail. I would not go higher than 8 in magnification or lower than 50 in objective size for a beginner. There are large astro-binoculars out there but they are for advanced users. You can buy binoculars at sporting goods stores and all of the major chains like Costco, Walmart and Amazon. A good online store that I have used for many years is Orion Telescopes. They have an excellent assortment, stand by their products and great customer service. They also have extensive descriptions and background information on types of binoculars and how to choose a pair. This is the penultimate, and most risky, gift idea on my list. There is nothing quite like getting that first telescope and experiencing “first light” - the first view of the sky through it. It is risky because telescopes are an investment in terms of money and longevity. There is nothing worse than buying a ‘scope that never gets used because it is too complicated, too heavy or of poor quality - they collect dust from never being used. With the right purchase there is no reason why a quality telescope will not last a person’s entire lifetime, or at least a good portion of it. Many nights of enjoyment and discovery at the eyepiece of a good telescope are pure joy to your stargazer. There are many telescopes out there and to pick just the right one for your stargazer is a real shot in the dark, so to speak, unless you have “insider information”. If your astronomer has spent time studying telescopes and selecting a “final one” and letting you know it - go for it. BUT, make sure there is a return policy that allows you to get your money back if things don’t work out. My recommendation for “first telescopes” is this. Put together a gift package or card that says that you will bankroll the purchase of a new telescope (I recommend setting a price limit as telescopes can cost thousands of dollars) after a selection process has determined the best telescope to buy. If this is a family member or significant other you can do this together. Astronomy, Sky and Telescope and Orion have sections on how to select a telescope and there are books on the subject as well. Going to a local astronomy club and attending a star party provides an opportunity to “test drive” different types of telescopes and look through them at a wide variety of astronomical objects. This will help immensely in the selection of a telescope. I hope this has helped you on your out of this world holiday shopping. Drop me a Tweet or email if you have any questions. Happy Holidays and clear skies. Tomorrow morning before dawn the waning crescent Moon will join Saturn in the southeastern sky. Earthshine is caused by our planet's oceans and clouds reflecting sunlight which illuminates the Moon's unlit surface. Tune in today, 12-17-14 to hear live NASA's latest on the Asteroid Redirect Mission. Learn how you can name a crater on the planet Mercury. 5 craters are up for naming and the competition to submit names runs from 12/15/14 to 1/15/15. This weekend, especially on Saturday and Sunday nights, we will enjoy the peak time for what I think is the best meteor shower of the year, the Geminids. I say best because it reliably produces a large number of meteors per hour (100-120) and many of them are bright. Plus the Geminids is the only major meteor shower where you can see a good number of meteors during the early evening hours instead of the hours just before dawn. The predicted peak of the 2014 Geminid Meteor Shower are the nights of December 13 and 14 but you can see Geminids from the 12th to the 16th. Each year at this time our planet encounters a debris stream of rock particles made by Asteroid 3200 Phaethon. The Geminids is the only meteor shower caused by an asteroid or what astronomers call a rock comet - all others are due to cometary debris. As Earth moves in its orbit around the Sun it collides with this rocky debris stream and the particles hit our atmosphere at 22 miles per second (79,000 miles per hour) to become “shooting or falling stars”. It is thought that the Geminds are brighter than other meteor showers because they involve larger and heavier debris than normal cometary dust and penetrate deeper into the atmosphere. The best place to see the Geminids is a location that is away from lights and obstructions such as trees and buildings. If you are a city dweller you still may see the brightest Geminids as long as you are not staring into a street light or nestled in amongst tall buildings. The view of the Geminids is worth it from the suburbs as long as lights and obstructions are minimized as best you can. Out in the country or along the beach is the best place to be. You do not need any equipment or know how to enjoy the show - just find a place where you can put a lounge chair or blanket to see the sky. 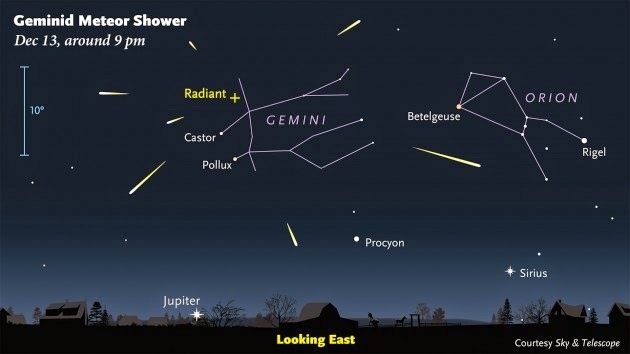 Starting at 9 p.m. look in the east for the constellation Gemini for which this meteor shower is named. Brilliant Jupiter is just below the constellation making it really easy to find and both will rise higher as the night progresses. 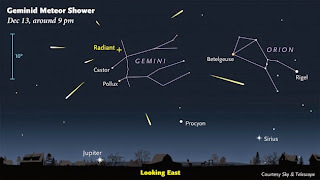 A meteor that is part of the shower can be traced back to Gemini. Sporadic meteors that are not part of the shower can be seen during the night as well. The shower will continue all night and be best an hour before dawn - about 4 a.m. The Last Quarter Moon will obscure the dimmer meteors but there should be a bright shooting star every couple of minutes from a dark sky site. The key to watching the shower is being comfortable, in other words WARM. The Geminids can appear anywhere in the sky but looking straight up gives you the widest viewing area - this is where the lounge chair or blanket come in handy. Enjoy the shower with family, friends or your significant other. Some music, food and beverages are an added plus. The weather may cloud us out in the WTOP viewing area for the Geminid Meteor Shower. Our best bet is to check the sky to see if it is clear when you want to go out to look for Geminids. If it is cloudy you can still observe the Geminid Meteor Shower by a very novel and cool means. As I write this I am listening to meteor radar - yes radar that scans for incoming meteors as well as satellites and space debris. It is a fascinating way - just heard one!! - to monitor a meteor shower like the Geminids. Essentially the louder a ping is, the brighter the meteor would be in the sky. You can listen during the day and night. Good hunting, clear skies or not! Enjoy these pics….comms have been down at sea. Be back to regular entries tomorrow. Sky Guy Heading to Florida. Been tough getting on the 'net - sorry. 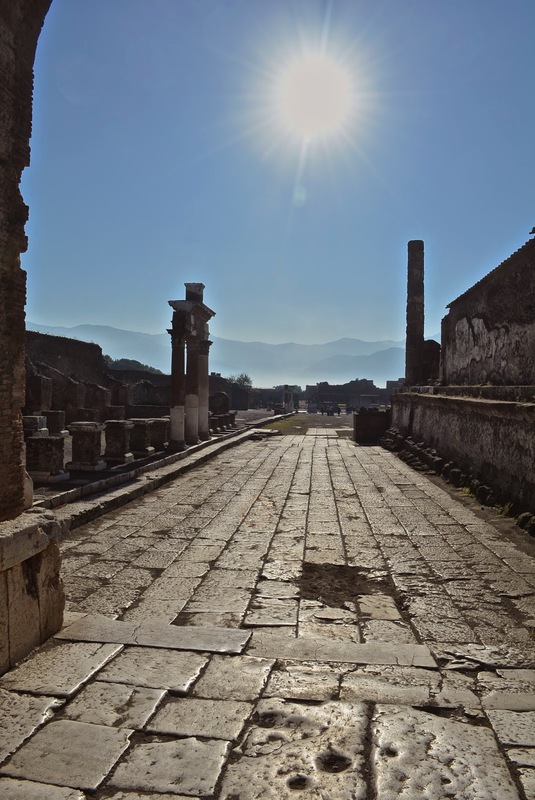 Enjoy this pic of the ruins of Pompeii which was destroyed 1,935 years ago by the eruption of Mt. Vesuvius. Thank You For the 2 MILLION+ Page Views! THANK YOU to each and every one of you that has visited my blog - all TWO MILLION PLUS OF YOU!!! I m in Rome and will be boarding Holland America's Maasadam tomorrow for a 21 day transatlantic voyage giving 9 lectures. Enjoy this pic of the Roman Coliseum at night. Here's to the next million page views! I am leaving for another Trans-Atlantic crossing, Rome to Florida abroad Holland America's Maasdam. This is a multiple weeks run and I am hoping to get Internet so I can stay in touch with you. 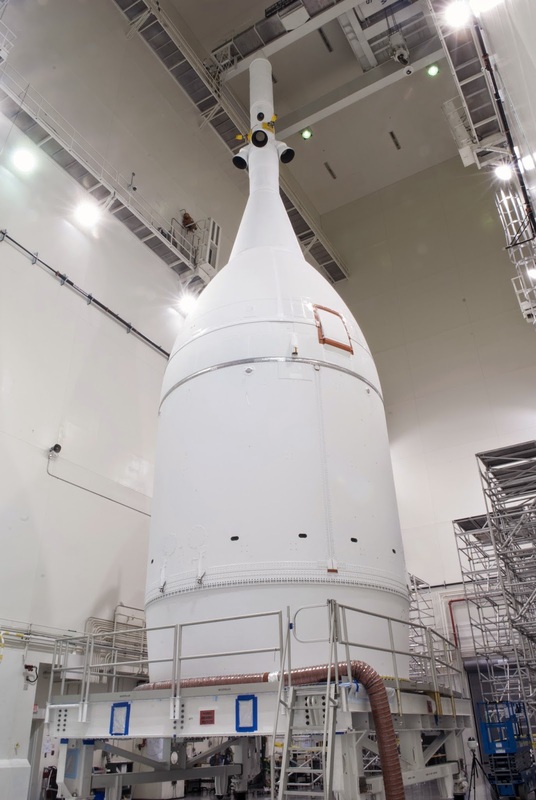 Be sure to mark your calendars for the 12/4/14 scheduled lift-off of Orion - see my previous blogs. 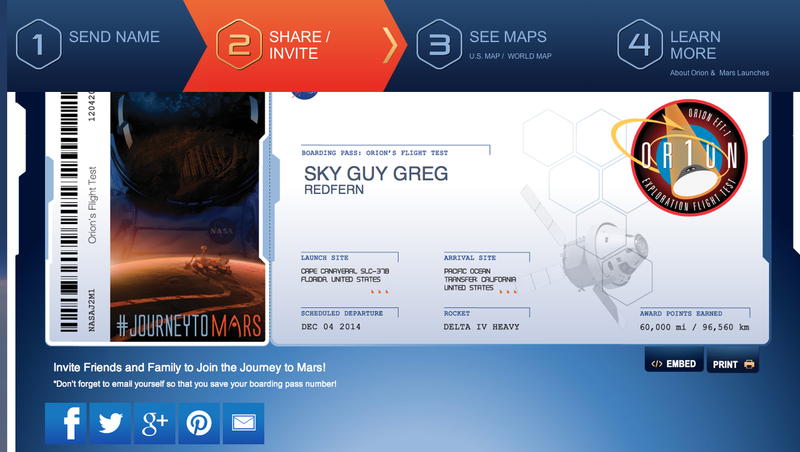 I will be following the mission of Exploration Flight Test-1 as best I can while at sea. Be sure to follow me on Twitter - @SkyGuyinVA - as that sometimes gets through better than my blog. Gear up to brave the cold and see the Leonid Meteor Shower on Monday and Tuesday starting at midnight until dawn. Get all the details here and I wish you clear skies and a high meteor count. Here is the latest from ESA on intrepid Philae. I sure hope that the plucky little spacecraft that could gets enough solar energy on her solar cells to power on again - especially as Comet 67/P gets closer to the Sun. Eventually Philae will be no more as the high temp from the Sun will do her in. Philae accomplished all of her data return which will rewrite the books on cometary surfaces. The main spacecraft, Rosetta, is in great shape and will continue data collection as the comet nears the Sun. Well, I finally got to see the movie 'Interstellar' today. I saw it in IMAX and I had to wear earplugs for most of the movie as the sound was WAY TOO LOUD!!! During the launch and space scenes I actually felt the sound waves in my chest….. There have been reviews on the science - right and wrong - in the movie as well as what movie critics think of it. Quite frankly I think I will be telling you things that I have not read so far about 'Interstellar'. To me there was a match up of things and themes in the movie to present day. To start off I think everyone interested in space should see the movie just for the visuals. They are exquisite and on par with what we saw in 'Gravity' but a tad more active in that the space scenes go to places other than Low Earth Orbit (LEO) - just like present day NASA is trying to do with the Orion/Space Launch System (SLS). I was amazed to see what is clearly a Saturn V launch vehicle used to launch an advanced wormhole transiting spacecraft into space. The spacecraft used to go to and fro from orbit to the surface and vice versa reminded me of the Sierra Nevada Corporation's "Dream Chaser" spacecraft. This was especially my thought in scenes when looking down the side view of the spacecraft in the movie. The movie hit upon some anti-science themes that were the norm for the society depicted. Most notably was the history book citation that we never landed on the Moon, that it was all propaganda designed to outwit the Soviet Union. With the mentioning of the Soviet Union I can't help but think of how we are now reverting back to Cold War ways in our time - Russia says they will be sending strategic (read nuclear capable) bombers to patrol areas in the Caribbean and elsewhere near the U.S. All because of tensions over the insanity in Ukraine. The main themes I picked up from the movie is how the most basic of human emotions - love and individual survival - showed the worst and best of humans. The power of love is described as possibly being a force that transcends space-time and can guide humanity in ways never before thought of, perhaps even to save humanity from the climate disaster befalling the planet. Well, this made me think of climate change and how it is now and will be affecting the planet and humanity. What is happening to Earth and humanity in the movie is what spurs the characters to the stars in hopes of finding a new world to inhabit. My thought in seeing all of this in the movie is that we have to take care of this planet we are on - together. There are NO other worlds nearby that can afford us the same benign (for now) living conditions. I doubt that there will be a wormhole that appears in the solar system that can be used to go to another galaxy to explore possible planets for colonization. Here is the simple truth - we cannot continue to propagate and exploit the planet like we are doing. There is going to be a tipping point in numbers of human beings that the planet can support in terms of food (like the movie), water and resources. We just can't keep up the way we are going - we can't. This movie more than any other sic-fi space flick I have seen made me think of the present more than the timeframe depicted in the movie. My guess is that the peril faced by humanity in the movie transcends to current day. I don't know where humanity is headed unlike what happens in the movie which has a good ending and I'll leave it at that. I can't say the same for present day humanity, the good ending part that is. What I can say with total conviction is that our efforts in space bring out the best we have in us. With all of the turmoil from war and evil that abounds in our world this is still the golden age of space exploration. We sail the sea of space like never before to destinations and mission that astound us. The future of humanity is in the stars and it must be reached from our continued habitation of Mother Earth. To get elsewhere in the Universe it will be from here. The best and worst in us will be competing to see which part of us wins. That is the message I got from Interstellar. After 10 years and 4 billion miles, preparations by the European Space Agency (ESA) are underway right now for tomorrow's landing attempt by the Rosetta mission's Philae lander on Comet 67/P. ESA is live streaming on the mission now. The world will be holding its collective breath as this washing machine sized lander attempts to do what has never been done before - safely land on a comet. If successful, and this landing is by no means assured of success due to the hazardous conditions that will be encountered, Philae will conduct at least several days of science observations. The lander will photograph, sample and dig into the surface of the comet to analyze pristine cometary material. The world should know if the landing was successful at 11:02 am EDT as that is when the touchdown signal will be received at Earth. That will be seven hours after detaching from the Rosetta orbiter. NASA is flying 3 of the 16 instruments on the mission and NASA TV will begin live coverage at 9 pm EDT on 11/12/14. Be sure to tune in to history being made as it happens! Can hardly wait - Go Philae! Today NASA rolls out the Exploration Flight Test-1 Orion spacecraft to the launch pad at Kennedy Space Center. NASA TV will have a live broadcast starting at 4:30 pm EDT to provide a briefing. There will NOT be live coverage as the process will take until the early morning hours of Tuesday to be completed. NASA plans to have file footage available on Tuesday morning. This is a BIG step for the whole program. EFT-1 is scheduled for launch on 12-4-14. I can hardly wait…..I will be at sea or I would be there to see EFT-1 launch. Take a look at this stunning video of the International Space Station (ISS) put together by a talented admirer of space. Enjoy the view in a dark room on as big a screen as possible. The Milky Way, Northern Lights, Moon shots and Earth shots are really quite amazing. Got back from Barbados via Toronto, Canada late last night. Sorry about the lack of blog entries but it was difficult to upload while at sea. I have been catching up on email and getting ready for the next cruise in a scant few days. I am hopeful that I will be able to stay in touch with you. There is MUCH going on next week with the roll out of NASA's first spaceflight ready Orion, the landing of Rosetta's Philae Lander on Comet 67/P and who knows what else might happen. I'll have blog posts for you, rest assured. In the meantime, enjoy this HD video of the 12/4/14 Exploration Flight Test-1 (EFT-1) mission. This is the week to spot the elusive planet Mercury. Details here. Here is my pic of Mercury from the Atlantic. Not everyday you see this in the ATLANTIC! 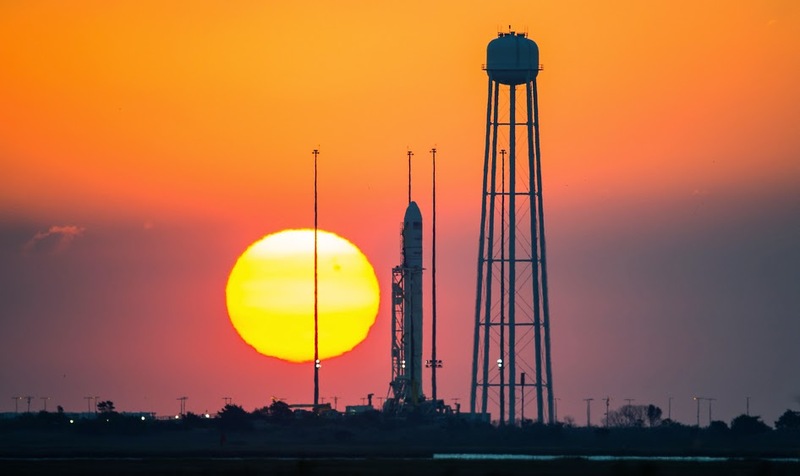 NASA Wallops Island has done its 1st assessment of damage to structures and the environment since yesterday's explosion of the ISS resupply mission ANtares rocket - see yesterday's blog. This will be an ongoing situation with NASA and Orbital posting additional updates. I am just learning of the explosion, or in NASA terms, mishap, of the Orbital Sciences Antares rocket just after launch on 10/28/14. News travels a bit slow while crossing the Atlantic Ocean even in the Internet age. The unmanned resupply mission to the International Space Station (ISS) was the 3rd resupply mission for the Dulles, VA based Orbital Sciences Corporation. This was the st launch of the two stage Antares rocket from NASA's Wallops Island Flight facility, and was the largest launch vehicle to ever be launched from the historic facility. The Antares lifted off and exploded 6 seconds later and was captured live by NASA TV HD cameras. The explosion is all the more dramatic as it was at night. Fortunately there were no injuries but I am pretty sure the launch pad had to suffer some damage from the exploding fireball and debris. The launch had been originally scheduled for 10/27/14 but had to be scrubbed due to a sail boat being in the launch zone. A mishap investigation board will be convened to determine what caused the explosion. The rocket sends telemetry (data) back to mission controllers for a large number of engine and rocket sensors plus the board will review manufacturing records for the record. There will also be wreckage that can be used to determine what happened. I am pretty sure Orbital and NASA will find out what happened and make sure that the issue is corrected. It has been a long time since there has been a US launch mishap like this and it proves once again that launching rockets is not a slam dunk evolution. Here is NASA's official comment on the mishap. Also, here is the news conference that was held by NASA regarding the mishap. The other resupplier to the ISS is SpaceX and its Falcon 9 rocket and Dragon capsule. SpaceX will have to do the resupply missions until the cause of the Orbital Sciences launch mishap is found and corrected which will take some amount of time. Check out this UNREAL picture taken of Jupiter by the Hubble Space Telescope. Get the background on the photo here. Sea Dream I leaves for Barbados tonight. Greeting from the Atlantic Ocean. Getting settled in on Sea Dream I and hoping for clear skies tonight for our onboard guests as we attempt to hole our 1st "At Sea Under The Stars" session. If you are on the US East Coast you might be able to see the newest resupply mission to the International Space Station (ISS) launch from NASA'sWallops Island Flight Facility, located on the Eastern Shore of VA. This will be the first nighttime launch of the Antares Rocket so you need to check this visibility map and this info from Orbital to see if you can se the ascent of the rocket from your location in DC, VA, MD, and the US East Coast. A rocket launch at night is a sight to see as I saw a space shuttle and the LADEE mission do so and it was impressive. Best Artistic Rendition of a Black Hole? Hola From Malaga, Spain Space Placers! Lots of walking amid ruins, castles and Picasso today. 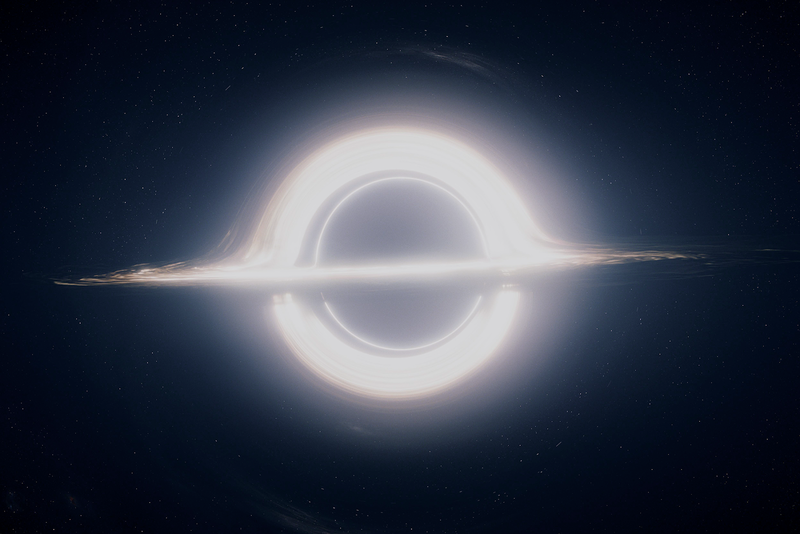 But here is an artistic rendering, perhaps the most accurate ever of a black hole that was done for the upcoming movie Interstellar - see my previous blog. The amazing past of it is that Kip Thorne, a black hole expert is the moving force behind this artistic rendering - AND he claims that he will be able to publish two science papers because of it. The Movie opens in two weeks. Greetings from beautiful Malaga, Spain. A truly gorgeous city…. This composite NASA Hubble Space Telescope Image captures the positions of comet Siding Spring and Mars in a never-before-seen close passage of a comet by the Red Planet, which happened at 2:28 p.m. EDT October 19, 2014. The comet passed by Mars at approximately 87,000 miles (about one-third of the distance between Earth and the Moon). At that time, the comet and Mars were approximately 149 million miles from Earth. The comet image shown here is a composite of Hubble exposures taken between Oct. 18, 8:06 a.m. EDT to Oct. 19, 11:17 p.m. EDT. Hubble took a separate photograph of Mars at 10:37 p.m. EDT on Oct. 18. 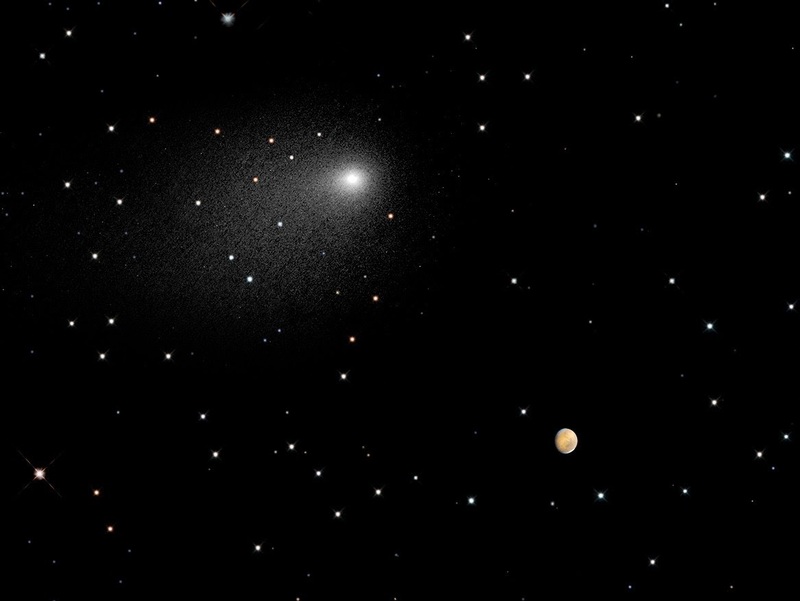 The Mars and comet images have been added together to create a single picture to illustrate the angular separation, or distance, between the comet and Mars at closest approach. The separation is approximately 1.5 arc minutes, or one-twentieth of the angular diameter of the full Moon. The background star field in this composite image is synthesized from ground-based telescope data provided by the Palomar Digital Sky Survey, which has been reprocessed to approximate Hubble’s resolution. The solid icy comet nucleus is too small to be resolved in the Hubble picture. The comet’s bright coma, a diffuse cloud of dust enshrouding the nucleus, and a dusty tail, are clearly visible. The images were taken with Hubble’s Wide Field Camera 3. Touring tomorrow before Sea Dream I arrives on Saturday. Wish I was going to be in the UK in the near future as there is going to be a limited release of Stanley Kubrick's immortal 2001: A Space Odyssey. This is being done in advance of the highly anticipated (and highly praised) movie Interstellar directed by Christopher Nolan. 2001 is my all time space scifi flick because of the grandeur of the sets, story and music. I saw 2001 when it premiered in 1968 at Grauman's Chinese Theater in Los Angeles, CA. Pretty amazing memory even after all these years. 2001 can to this day, 40+ years after its release, hold its own against CGI and special effects. The low Earth orbit (LEO) Moon, Jupiter, spacecraft sets still astound and spell bound viewers. It is a classic that will never be surpassed. The movie is best seen now in BluRay on a large screen TV in a PITCH BLACK room with surround sound speakers. Still gives me goose bumps to see the Moon from orbit and on the surface with the beautiful music and sets. Interstellar looks amazing and I love Matthew McConaughey and Hans Zimmer, so………. I will be there to see it I hope on opening night 11/7/14. I am heading to sea again aboard Sea Dream I so I may be out of touch at times. 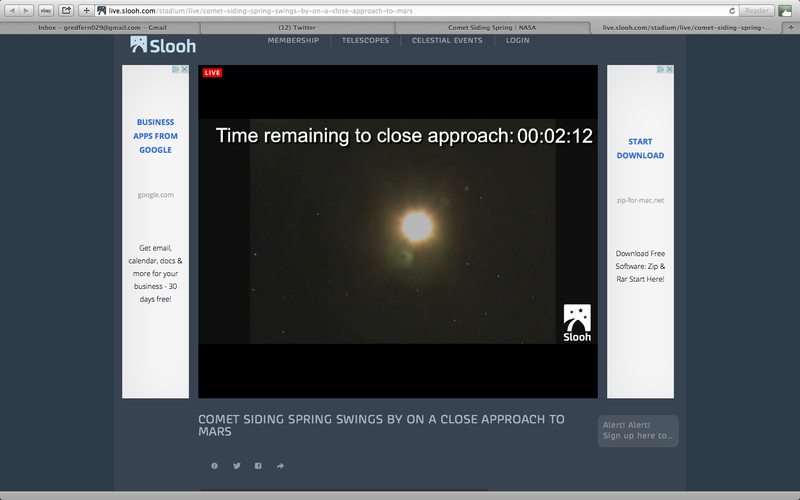 Comet Siding Spring - see my last blog - passed Mars yesterday and all 3 NASA orbiting spacecraft are A-OK. I think ESA and India's orbiters are as well as I have not heard anything contrary. It will take a week or so for the data and pics obtained by the orbiting spacecraft and the two rovers on the surface to be downloaded and analyzed. I am sure there will be some good stuff from this historic event. If it is clear the next few mornings before dawn get out and look for the Orionid Meteor Shower. These cometary particles that hit the Earth's atmosphere at an amazing velocity of 148,000 mph are from Halley's Comet. The shower is underway now with the peak predicted for Tuesday morning before dawn. The predicted peak is about 20 meteors an hour. Get more details here. Hope you have clear skies and a good show. Check out the Rosetta mission trailer (see my previous blogs on the mission) done by the German Aerospace Center (DLR). It is a teaser for the upcoming landing on Comet 67/P of the Philae lander on November 12th. There is supposed to be an 11-minute film coming out as well. Better than sic-fi because it is real and is going to be something to see…. Tune in today, 10-14-14, at 2 p.m. EDT to hear the latest finding from NASA's Mars Atmosphere and Volatile Evolution (MAVEN) mission to Mars. NASA is inviting people around the globe to step outside during Earth Science Week, Oct. 12-18, observe the sky and share their observations as citizen scientists. NASA's #SkyScience activity is part of an annual educational event organized by the American Geosciences Institute to encourage the public to engage in Earth sciences. Citizen scientists can participate in this global Earth science data collection event by observing, photographing and reporting on clouds over their location as a NASA satellite passes over. Reports and photos will be compared to data collected by NASA Earth-observing instruments as a way to assess the satellite measurements. Using the hashtag #SkyScience, participants are encouraged to post their cloud and sky photos and observation experiences to Twitter, Instagram, Facebook, Google+ and Flickr. Throughout the week, NASA will share some of the most interesting photos on the agency's social media accounts. In addition to #SkyScience, NASA has been engaging students in cloud observation for years through the agency's Students' Cloud Observations On-Line (S'COOL) project. “#SkyScience is another opportunity to get lots of reports in a short period of time and enable additional statistical analysis," said S'COOL project lead Lin Chambers of NASA's Langley Research Center in Hampton, Virginia. Hope you will join in. If you have been reading my blog for awhile you know that I am a lunatic as to ALL things lunar. My fave NASA mission is the Lunar Reconnaissance Orbiter (LRO) which has been rerouting the books on the Moon since its launch in 2009. NASA has extended LRO for another 2 years and I am sure we will learn more about our Moon during that time. The BIG news released by NASA on October 12, 2014, is that LRO has found very strong evidence that volcanic activity on the Moon took place much later than previously thought. Before LRO's findings it was generally thought that volcanic activity on the Moon ceased over a billion years ago. LRO's detailed and exquisite photographic coverage has found surface features that show volcanic activity as "recent" as 50-100 million years ago. In geologic time that is fresh and recent. 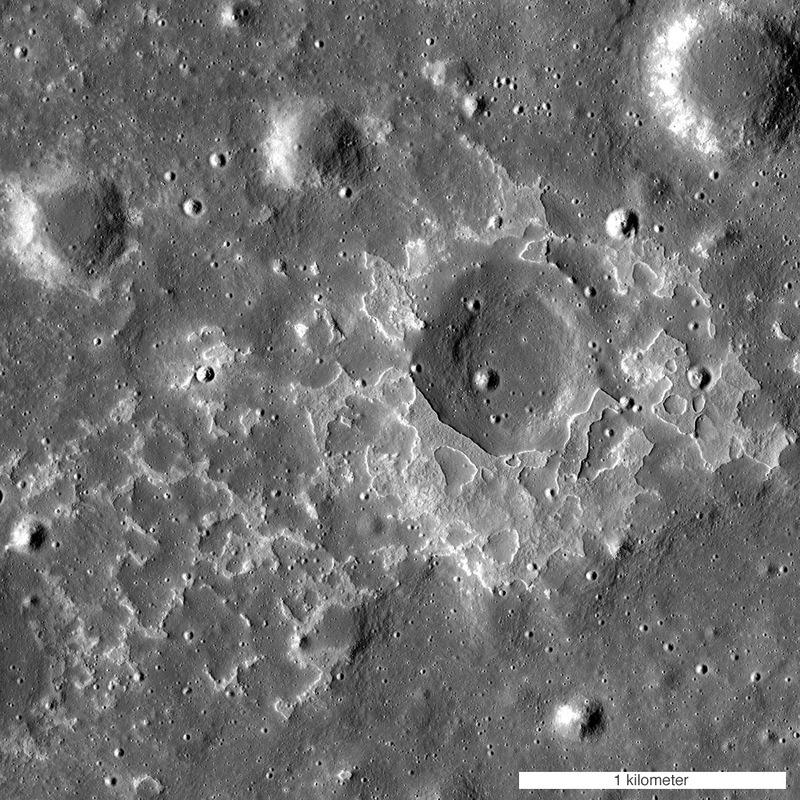 Called "irregular mare patches" (IMP) by lunar scientists, over 70 of them have been found by LRO whereas only 1 was previously known. This news follows the recent announcement that the Sea of Storms is not an impact crater but is a large surface feature caused by volcanic structures beneath the surface - see my blog. We will be learning more about Moon in the years to come as LRO and other nations' spacecraft explore this most beautiful and intriguing world. PS My last "Let's Talk About Space at Shenandoah National Park" for this season is tonight at 9 pm at Skyland Conference Center. My talk is a special one, "The Universe and You". I wish you all could be there….. Here is an interesting press release about the world's religions and their response to extraterrestrial (ETs). We know there are other worlds beyond our solar system - almost 4,000 confirmed with thousands more to confirm. And it is currently thought that our Milky Way Galaxy has millions if not billions more exoplanets, including planets similar to our own Earth. A subset of astronomy called astrosociology is starting to pop up on the Internet and may achieve mainstream status someday. Interesting subject. If ET is found to exist it will transform humanity in some form or fashion. I personally believe we will see this come to pass someday as the Universe is just too full of planets, stars and the basic ingredients for life as we know it not to have other life. Here's an update from NASA on their newest mission to Mars - Mars Atmosphere and Volatile Evolution (MAVEN) . 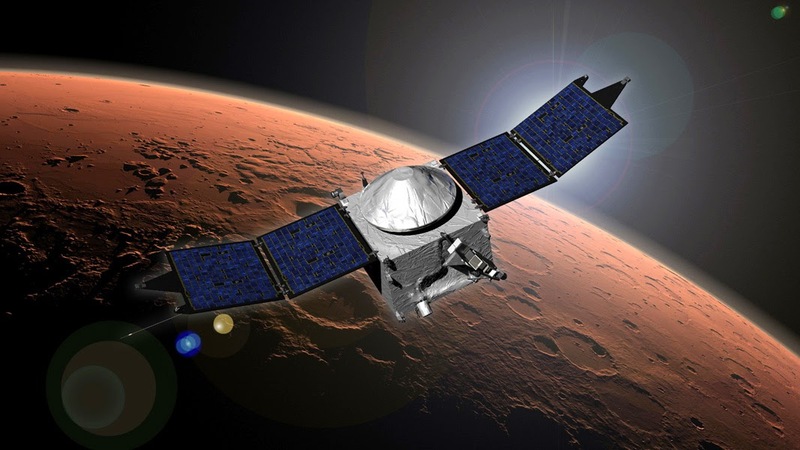 There will be a live teleconference on MAVEN's first few weeks at Mars on Tuesday, October 14, 2014 at 2 p.m. EDT. It will be interesting to hear these very first results. Get yours here. You have until October 31, 2014 to do so. It is really cool to know our names will fly aboard Orion on Exploration Test Flight-1 and other deep space destinations as well. A magical night last night at Shenandoah National Park at Bald Mountain Overlook. 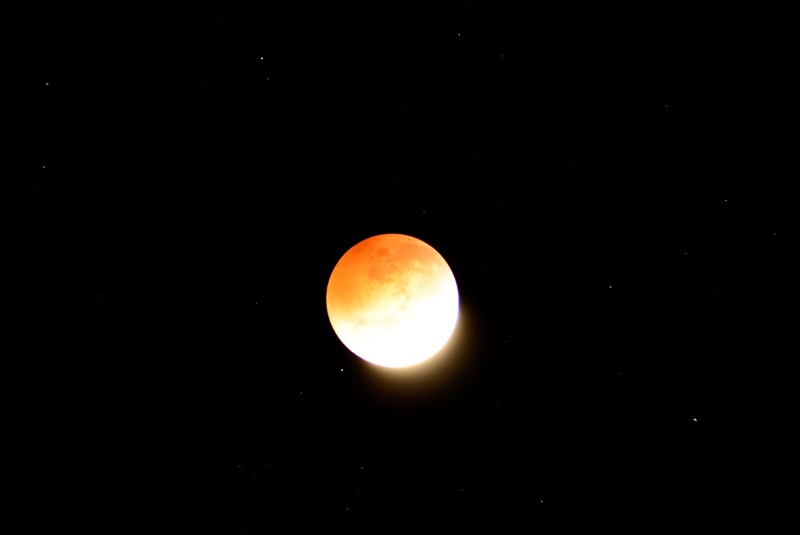 The sky was clear except for an occasional puff of cloud forming and leaving and the Full Hunter's Moon was resplendent before, during, and after the total lunar eclipse. I hope you got to see the eclipse. If not, perhaps my pics will help you envision what it was like. 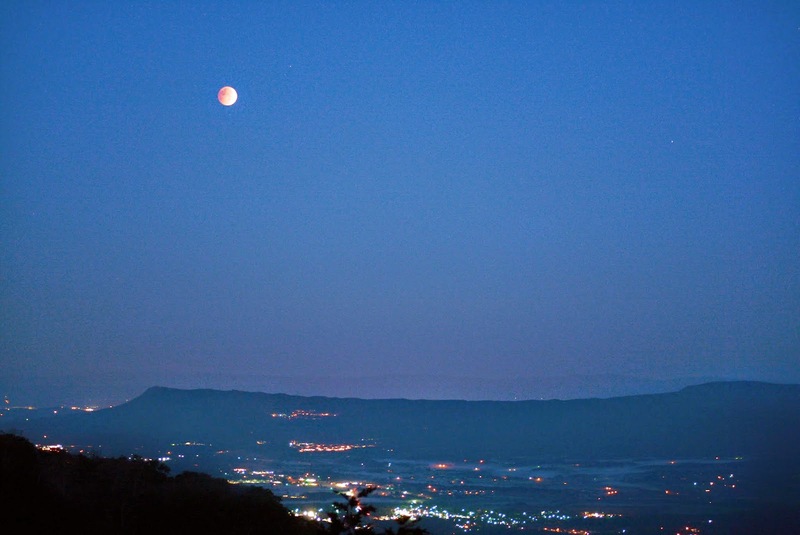 The early morning hours of October 8th will provide skywatchers a pretty sight - a total lunar eclipse. We had another total lunar eclipse back in April but I was at sea so I did not see it here in the U.S. but did witness it in the Atlantic. This eclipse will involve the Full Hunter’s Moon, or the first Full Moon after the Full Harvest Moon that took place in September. It will also present a bit of a viewing challenge for viewers on the U.S. East Coast as it will occur for low in the West and just before dawn. The Moon will enter the outer shadow of our planet called the penumbra at 4:45 a.m. EDT. The penumbra is a ghostly shadow that is hard to see but should be visible in binoculars or a telescope. Things get much easier to see when the Moon enters the dark umbra shadow of our planet at 5:15 a.m. EDT to start the partial eclipse phase. You will see the dark curvature of our planet projected onto the Moon and as time goes on more and more of the Moon gets covered. At 6:25 a.m. EDT things get real interesting as this is when the total eclipse phase begins - the Full Moon is completely immersed in the shadow of our planet. The half-way point of the eclipse occurs at 6:55 a.m. EDT. No direct sunlight is falling on the Full Moon in this phase of the eclipse and we should see the characteristic “copper penny” color covering the Moon but the brightening sky due to sunrise at 7:11 a.m. EDT will hinder the view. The best place to see the eclipse is an area that has an unobstructed view of the sky and western horizon - no trees or buildings to block the view as the Moon will be getting lower and lower in the West as the eclipse goes on. Get more details http://www.skyandtelescope.com/press-releases/october-2014-lunar-eclipse/ here and http://science.nasa.gov/science-news/science-at-nasa/2014/18sep_lunareclipse/ here. Binoculars or a small telescope will help your view as you will be able to see the Moon and its colors far better than with the unaided eye. I saw the April eclipse in almost the same viewing circumstances as this eclipse will be - low in the West with the sky brightening due to impending sunrise in the East. The dimmed Moon will become harder and harder to see and will set just about sunrise. The copper reddish color that you should see is caused by sunlight passing through the Earth’s atmosphere and falling upon the Moon’s surface. If you were an astronaut on the Moon you would see the darkened Earth surrounded by a ring of light along the circumference of our planet. All of our planet’s sunrises and sunsets would be visible as a reddish colored ring. It is this light that we see on the Moon during the totality phase of the eclipse. The color and its brightness that we view on the totally eclipsed Moon can vary due to worldwide atmospheric conditions. The total lunar eclipses that occurred right after Mount Pinatubo erupted in the Philippines in 1992 were so dark as to be nearly invisible in the sky - even in my telescope. This was due to the amount of aerosols and debris from the volcano’s eruption that were placed high into the Earth’s atmosphere which blocked the passage of sunlight through our atmosphere. 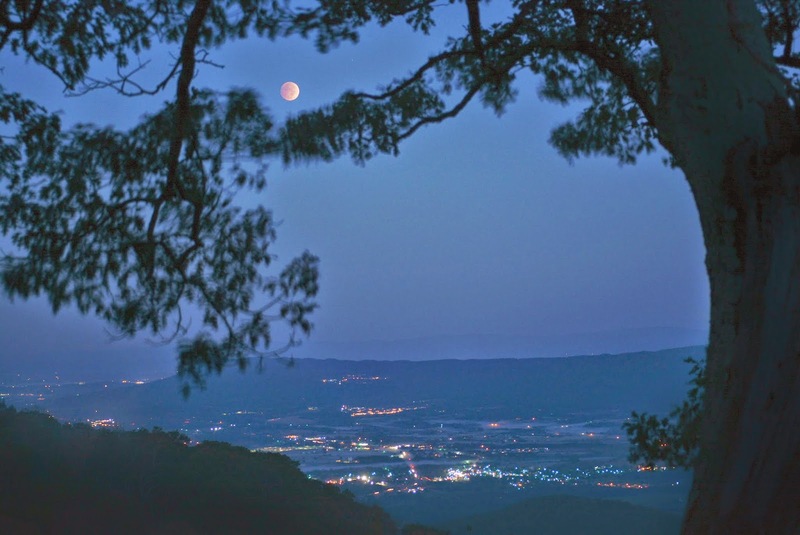 Scientists can measure the brightness and color of the totally eclipsed Moon to glean the condition of the Earth’s high atmosphere. If it is cloudy and/or you want to watch the whole eclipse, you can tune in on the Internet to Griffith Observatory in Los Angeles, California which will provide a http://www.griffithobs.org/exhibits/special/Lunar_Eclipse_October_2014.html live web stream. The stream will begin at 4:15 a.m. EDT and conclude at the end of the umbral eclipse at about 8:45 a.m. EDT. You can take pictures of the eclipse if you have a camera and tripod. A zoom lens is a big help but almost any camera will capture the Earth’s umbra and the color of totality. You can get more information https://support.nikonusa.com/rd?1=AvMc~wojDv8S~xb~Gv86~yIhazIqmCf73H7CBz7~Pv8L&2=12344 here. The really good news is that with this total lunar eclipse we are continuing a remarkable series of http://science.nasa.gov/science-news/science-at-nasa/2014/27mar_tetrad/ four consecutive eclipses, all visible from North America which is called a tetrad. 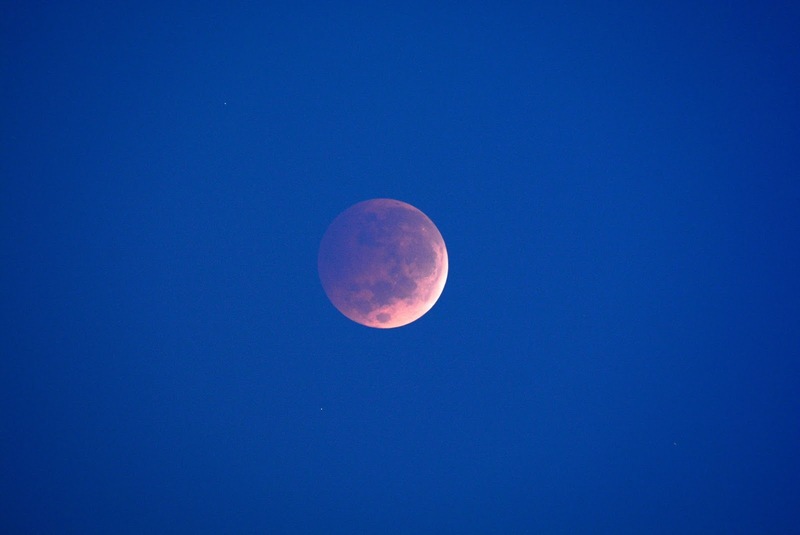 The next total lunar eclipse will be April 4, 2015. Here’s to clear skies for all.